Jozzey07: Both these books have an amazing blend of, action and comedy. aps3644: More of Riordan's magic in a different local. elbakerone: Both books deal with young boys coming to terms with a supernatural inheritance from their fathers and entwine action/adventure with friendship and family. legxleg: Although it is set in Ancient Greece, not modern times, Nobody's Princess and its sequel Nobody's Prize take a similarly fun and irreverent view of Greek mythology. Runa: Both series feature middle school aged kids who have superpowers, working together to solve mysteries and take down larger-than-life bad guys. bell7: Another humorous, updated take on Greek mythology. This is a great book to do guided reading with older elementary students. One of the reasons it is great is because it isn't too complex of a read but it is written in great detail, expression, and imagination. The book is about a boy who is a modern day Greek demi-god. His father is Poseidon and his mother is a mortal. This book is really a good way to engage the whole class because of the many relatable characters and the very exciting content. It is a book filled with great details, setting, and imagery. It is a great way to show students how to take something such as Greek mythology and put a unique spin on it. It also is good because there are some parts that are more complex reads and some that are easier which means that it can be actively engaging for most students within a class. This book is about percy jacksonfinding out he is a demi-god because he knows this his mom gets captured and he goes on a quest. Along the way he makes freind with grover and annabeth. Later on he discovers that his father is Poseidon. Before percy makes it to camp half blood, his mom gets captured by a Minotaur and sent to Hades. 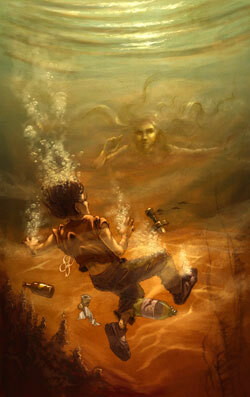 Percy jackson in search of his mom stumbles apon monsters like the one and only Medusa. The only reason the monsters are after him is because they think he stole the lighting bolt but really it was luke. The Lightning Thief (Percy Jackson and The Olympians #1) is the first novel in the Percy Jackson and The Olympian series. The series consists of five novels: The Lightning Thief (2005), The Sea of Monsters (2006), The Titan’s Curse (2007), The Battle of the Labyrinth (2008) and The Last Olympian (2009). 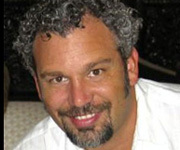 It has since been followed by a sequel series of five books titled The Heroes of Olympus. The Lightning Thief received mostly positive reviews and won awards including the School Library Journal Best Book of 2005. The Lightning Thief has all the elements to make me purr like a kitten but somehow it left me slightly disappointed. I enjoyed The Lightning Thief but I didn’t love it and that surprised me. So, a little recap of the story, as I see it. Percy is always getting into trouble. Typical twelve year old boy if you ask me! He thinks his problems are caused by his dyslexia and ADHD playing up. But this isn’t the case, Percy is no ordinary guy, he’s a demigod. He sets off on a quest with a disguised satyr, and the half-blood daughter of Athena, to settle a feud between Zeus, Hades, and Poseidon. Poseidon has been accused of stealing Zeus’ lightning bolt, and unless Percy can return the bolt, there will be a war between the gods. Along the way Percy discovers who his father is, no ordinary mortal of course, and Percy and his companions meet the Furies, Medusa, the motorcycle thug Ares, and various other immortals…. I just love myths, and legends. But somehow at times this just seems too far-fetched. Can I say that? When I’m talking about fantasy? Well, I just did! Greek Gods in the 21st Century – Some of it works and some of it fell short of perfect. Can you envisage a modern day Mount Olympus on the 600th floor of the Empire State Building? The door to Hades right there at DOA Recording Studio, somewhere in LA, really? I see what Rick Riordan’s trying to do, giving Greek mythology a modern day voice to entice the younger reader into an awakening interest in Greek mythology. I applaud him for that but maybe for me it was a bit too much…… modernising. I struggled to get emotionally involved in Percy’s quest. He’s had a hard life but I’m just not feeling it. Sometimes (not always) he sounds older than a twelve year old. To be fair maybe demigods abandoned by their fathers grow up too quickly, that would explain it. There are many parallels between The Lightning Thief and Harry Potter, and I’m a huge fan of Harry Potter, so this kind of irked me a bit. Percy’s closest friends are a girl, the half-blood daughter of Athena, Annabeth, and a boy, Grover, a disguised satyr, rather like Hermione and Ron, but in costume. Percy goes to Camp Half Blood were he trains, this reminded me of Hogwarts, but just different setting. The camps are divided into different houses which compete against each other in a Capture the Flag tournament. Percy realises his powers in water, and how water can heal him. The Capture the Flag tournament is a dead ringer for Quidditch. Of the two I preferred the fast pace and excitement of Quidditch. One of the houses has kids who Percy doesn’t get along with, so Slytherin. Percy and friends use an invisibility cap – invisibility cloak in Harry Potter. Incorporating dyslexia into the storyline. This is great. This makes dyslexics cool! Dyslexics can read and understand ancient Greek. It’s about time that dyslexics get the attention and recognition they deserve. The ADHD. Again. Clever. Stop slagging off those kids that can’t concentrate in class. They have advanced reflexes, and are battle ready! What else did I really enjoy? The humour. Made me chuckle. Humour rating, 5 crazy stars. Medusa. I loved this part. Stop staring! Serves you right haven’t you heard it’s rude to stare. Medusa grabbed me by the scruff, while I clamped my eyes tight, shut. You would wouldn’t you? Medusa rating 5 stars ! The Three Furies, especially Mrs Dodds. The nasty step dad got his comeuppance. Enjoyed this. He deserved it. The twist in the tale at the end. Of course I saw this coming but nice twist. This first book in the series is middle grade fiction. I sense that as the story develops the characters will grow older, and find their emotional voice and depth. I would be interested in reading more of this series to see how it progresses. If I don’t I’ll be in trouble as my daughter is a huge Percy Jackson fan! Highly recommended for readers of Middle Grade, YA, Fantasy, Mythology, Adventure and anyone who enjoys a good laugh. Oh, that’s me! The Lightning Thief by Rick Riordan is a book that is about a boy named Percy Jackson who has dyslexia and ADHD. When school gets out for summer, Percy, his mother, and Grover(Percy's friend) plan to go to a beach house on vacation, but get attacked from a Minotaur on the way there. The minotaur grabs Percy's mother, who disappears in a gold flash. Percy kills the minotaur and then passes out. Percy awakes at camp Half-Blood. At camp Half-Blood, Percy learns he is the son of Poseidon: the god of the sea. 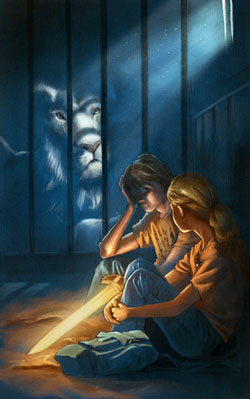 Another monster attacks Percy at camp, so Chiron(the camp director) sends him on a quest with Grover and Annabeth. It turns out, Zeus's master bolt has been stolen, and Zeus blames Poseidon, who blames Hades. When Percy and his friends travel to the underworld, Hades accuses Percy of taking his helm and the master bolt. Hades threatens to kill Percy and his mother, who is a prisoner of Hades. Percy and his friends escape and then realize that Ares(the god of war) had stolen both items. Percy beats Ares in a sword fight and since he lost, Ares had to give Percy the helm and the master bolt. Percy returns both items to the owners. In return for his helm, Hades safely returns his mother to Percy. Back at camp, Luke, a friend of Percy's, betrays him and tries to kill him with a dangerous scorpion. Percy gets stung, but survives. "The Lightning Thief" is perfectly paced, with electrifying moments chasing each other like heartbeats, and mysteries opening out in sequence. The action never feels gratuitous; it draws its depth from the myths at its source. Riordan's fast-paced adventure is fresh, dangerous, and funny. I asked Argus to take me down to cabin three, so I could pack my bags for home. 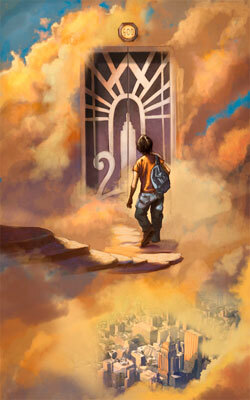 This LT work is the first volume (of five) in Rick Riordan's series, Percy Jackson and the Olympians. Please do not combine it with any other individual title or collection of titles from the series. Thank you. In this stunning collectors' edition of The Lightning Thief, Percy Jackson's world is brought to life with eight full-color plates by the series jacket artist John Rocco. The edition comes in an elegant slipcase with a ribbon bookmark, rough edges, and cloth cover--a perfect keepsake for fans of this truly epic series. That promise is what I tried to achieve when creating the pictures for this incredible series. My approach has never been just to describe a scene from the book, but to create an illustration that offers tension and mystery--an image that provides just enough information to leave the viewer wanting to know more.